In 2001, racing driver Alex Zanardi lost both of his legs in a high-speed crash. Now the owner of two Paralympic gold medals, Zanardi considers the accident to be "one of the greatest opportunities of my life." We consider him an essential addition to The Cult. For Alex Zanardi, everything is a project. Do the research, put in the work, and you can achieve something to be proud of. Life will not always be perfect – Zanardi, more than most, has a deep understanding of this – but if the commitment is there you will be able to hold your head high and have some fun along the way. It's a blueprint that has served him well, through good times and bad. As a young man, Zanardi set his sights on making a career in motorsport. The hard graft went in – hours spent working on go-karts, late nights in the garage while friends ventured out in search of fun – and the results followed. Eventually, against the odds, he broke into Formula One during the 1991 season. His career in the highest echelon never really took off, but he didn't let it bring him down – Zanardi is an almost unfathomably upbeat character, even in a sport full of dreamers. Still, by 1995 he had reached a crossroads, and a new project was needed. He found it in America. Zanardi relocated to the U.S. and was an almost instant smash hit, becoming champion of the CART series in 1997 and '98, a time when the category was stacked with talent. With that job done, he returned to F1 for a second attempt at his dream. In 2001 he returned to America to recapture past glories, but again the results wouldn't come. Zanardi's season never got off the ground and, now nearing his 35th birthday, it seemed as though his star would fade out, that he would disappear into the ranks of former champions whose talents have ebbed. The time had come, it seemed, to walk away. Fate had other ideas – and a very different project awaited. On 15 September 2001, Zanardi was involved in a horrendous high-speed collision at the EuroSpeedway in Germany. His injuries were awful: on the ensuing journey to a Berlin hospital his heart stopped seven times and he had lost three-quarters of his blood. He somehow survived, but both of his legs were amputated. Zanardi's injuries might be described as "life changing", and from a practical standpoint they undeniably were. Clearly, he had to adjust to a new way of living. But it did not change him as a man. The approach remained the same – find a project, do the work, see the results. And, after the crash, the run of poor luck seemed to have been broken. After he lost his legs, he first woke up and felt glad to be alive and able to hold his young son. Next – probably with Niccolò still in his arms – he began to think about the next project. This methodical thinking was undoubtedly crucial to Zanardi's recovery. His rehab plan was described as "ambitious", but then it was also ambitious for him to dream of racing in F1, or conquering the U.S. racing scene. This was just another challenge to work through. Because of this approach, he was able to climb back into his car just two years after the crash and drive the 13 laps he had missed at EuroSpeedway in 2001. That lit a fire. Next project: return to motorsport full-time. He achieved this by moving into the World Touring Car Championship in 2005. Driving for BMW, he won four races over five years and scored another six podiums. This despite competing with hand-controls, being older than most of his competitors, and having almost no history of driving a car with a roof. It was highly impressive. But what came next took the Alex Zanardi story to places usually reserved for Hollywood movies. In Zanardi's situation, most would feel that returning to motorsport was enough of an achievement. The World Touring Car Championship is not an amateur category – he was racing a group of elite drivers, none of whom would have given him an extra inch because of his injuries. Nor would he have wanted them to. Despite this, Zanardi, man of projects, felt the need for something else. And so it was that he took up competitive handcycling with the determination and commitment he'd previously displayed in reaching F1 and winning titles in America. It was never really a surprise that he was very good at his new sport: the racing instinct must have helped, and handcylcing, like motorsport, requires huge upper-body strength. There were transferable skills. Still, the sheer level of his achievements must have surprised even Alex, as he went on to win the New York City Marathon in 2011, and also conquered the Rome and Venice equivalents. 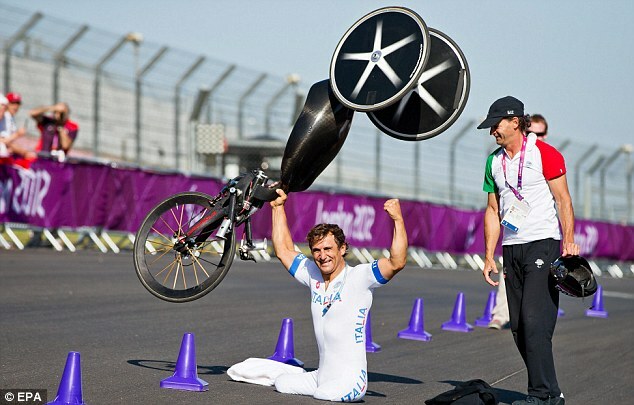 The 2012 Paralympic Games were the next goal, and once again Zanardi's work paid off. He won gold in the men's road time trial H4, repeated the trick in the individual H4 road race, and added silver in the mixed team relay H1-4. It was an incredible chapter to add to his already compelling life story. Still, what makes Zanardi so worthy of Cult status is not the number of wins he has to his name, it is the approach he brings to all aspects of his life. Though he was a huge success in the U.S., it's fair to say that he has had more downs than most racing drivers. His first F1 stint was unremarkable: he was in and out of drives because of a lack of budget and suffered a huge accident at Spa in 1993. The second was an unmitigated disaster. And, of course, there was the devastating crash in Germany, an event that very nearly killed him. There are drivers who wouldn't have recovered from the first setback, let alone the second two. Zanardi has been described as a hero in the truest sense of the word, a rare example of a sportsman whose life really is worth taking lessons from. He is seen as an example to all. If Zanardi can get over his setbacks, then surely no challenge is too difficult. It is perhaps a bit simplistic to say this. Clearly, Zanardi is wired very differently to most of us; he is built to deal with things in a hugely effective way, determined beyond belief and always buzzing with positivity. And he's used to fighting: his life has been characterised by dealing with knocks and coming back stronger. So, when he took the biggest knock imaginable, it's little surprise that his comeback topped everyone's expectations. This is in no way to diminish what he has done, particularly since the accident in 2001. But it is almost as if this was all planned beforehand, all part of the project. I have an inkling that if you offered him the chance to go back in time and skip the race that cost him his legs, Alex would politely decline, explaining that everything happens for a reason. Indeed, he now calls the accident "one of the greatest opportunities of my life." It has been said that if anyone was going to suffer such dreadful injuries, Zanardi was the man best prepared to cope with them and thrive in the aftermath. It's hard to disagree with that. There have been several defining moments in Zanardi's life. The titles in America deserve a mention, as does his most impressive F1 race for Williams – on home turf at Monza – as well as the fateful crash in 2001. But what really stands out is that first Paralympic gold. This was something truly symbolic, with the race run at the Brands Hatch circuit in Kent. More than two decades earlier, Zanardi had driven on the same track in his past life on four wheels. He could never have imagined then that he would return after suffering such terrible injuries, but be happier than ever for it. But, knowing Zanardi, he could certainly have imagined winning. And so it was on 5 September 2012, when he beat his nearest challenger by 27 seconds to take home the gold. Afterwards, he was photographed sat on the track, his huge arms lifting his bike aloft. It is a rare image showing Zanardi without his legs – their absence is not visible on his bike, and he usually walks with prosthesis. Not that he appears 'disabled'. Nothing about Zanardi post-2001 has suggested a man whose life is in any sense impaired by the accident. Inspired, perhaps, but never impaired.